Naples attraction-guides.com - Naples, Italy attractions guide Naples San Francesco di Paola information about attractions, circular basilica, period features, Church of the Santa Apostoli, location and address details, Piazza del Plebiscito, tel / telephone number, general tourist information about San Francesco di Paola in Naples (Napoli) area, Italy (Italia) IT - Last updated 30/10/2012. 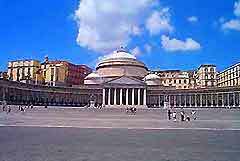 The' San Francesco di Paola, in the Toledo area of Naples, was originally based on the Pantheon in Rome and is located in the centre of Naples' Piazza del Plebiscito. Commissioned in 1817 by Ferdinand I, this striking, circular basilica is the ultimate in neo-classical grandeur in Naples and features many historic attractions and original period features. Inside the San Francesco di Paola temple, the magnificent main altar is detailed in gold and contains precious stones from the Church of the Santa Apostoli, which was sadly destroyed.